★ Contact us with your travel date details for a quote within minutes!! !★ Discounts available for last-minute trips, small & large group discounts, extended stay discounts!!!! Come to experience this one-of-a-kind gem in the heart of the Pocono Mountains!!!! 90 miles away from NYC! Imagine sitting on the deck – overlooking the creek and enjoying your morning coffee, marveling in the peaceful & serene sounds of the running creek, ecological wildlife, and spectacular scenic views. 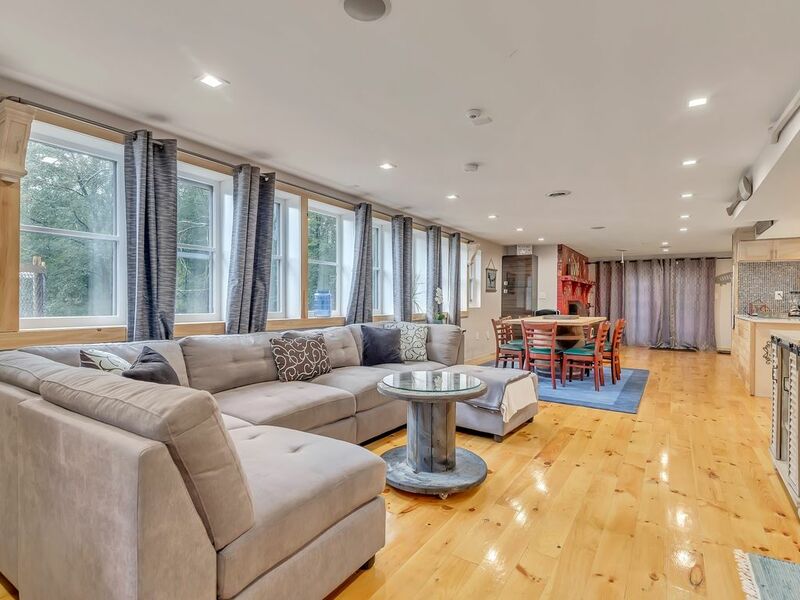 Situated on 2 acres of land, this 4-Bedroom & 4-Bath home features a newly renovated floor plan which brings together today’s modern updates and rustic interiors that the Pocono Mountains are desired for. Relax & soak in the private 7-person hot tub, which is available 365-Days a year!!! Located within minutes of local restaurants, bars, skiing, golf, vineyards, attractions & shopping, and with plenty of privacy. Whether you're looking to relax or have an action-packed vacation, you can find it all here! * Enjoy skiing/snow tubing at Shawnee mountain (15 min.) Camelback Ski, Blue Mountain All Season Tubing, or Alpine Ski & Tubing. * 5 - Golf courses within 15-20 minutes of the home. ★ Minimum age for renters is 21 (please inquire if younger). ★ Security damage deposit may be increased (depend on renters age). ★ Children always welcome. Home is not child-proofed. ★ All garbage must be taken out to the designated area and placed inside containers, for wildlife safety, no garbage can be left outside the home, or outside the designated garbage area. ★ By making a payment you are agreeing to our rental agreement. ★ Rental Agreement must be returned 5-days prior to arrival. * Pillows, Bed Sheets, and Blankets included. 3 LED Flat Screen TV's 65" - LED TV living Room. 32"- LED Roku SmartTV in the Master Bedroom. 32"- LED Roku SmartTV in the 2nd King bedroom. Lifesmart 7 Person Hot Tub Spa overseeing the Creek Available 365-Days a year!! Great house for a quick getaway! Wonderful house, you don’t have to leave the property! It’s like a resort! And so convenient to everything ! I’m tellin all of my friends about this place! Thank you Julie for such an amazing time! You were quick to communicate with and provided everything we needed! We will definitely be back! We really enjoyed our stay at Julie's place. It was close to all amenities and not too far from Camelback slopes (less than 20'). The house is nice, well decorated, clean and well equiped. Ideally for 8, the house accomodated well our group of 11. Julie is very easy to communicate with and accomodating. I really recommend this place to those who are looking for a great place for families not far from the ski areas and close to all amenities! The house was perfect for our couples ski getaway. It was very clean and comfortable. The bedrooms, kitchen and bathrooms had all the amenities we needed. Julie was available and prompt at answering any questions we had. The indoor and outdoor fire place and hot tub were perfect after a long day of skiiing. We couldn’t have asked for more!! Thank you we will all be back next year!! Excellent stay and very clean! The house was very clean with awesome décor. Great for a weekend getaway with a group of friends. Would definitely go back. ★ ALL WEEKEND BOOKINGS START ON FRIDAY. FOR SATURDAY CHECK-IN PLEASE INQUIRE BEFORE BOOKING [ When booking 2-nights, in which only 1 of the nights is a weekend night, weekend rates will apply for both nights, automatic pricing is not reflected in quote]★ ★ Rates are subject to change until reservation is confirmed. ★ Rates may be different for Holidays or local events. ★ The automatic quote is based on groups of 8 people. Additional charges for groups of larger than 8 may apply. ★ Additional charges for groups under the age of 25 may apply.